So, you want the look of wood shingle siding but don’t want to deal with the cost and maintenance of wood. You’ve come to the right place. 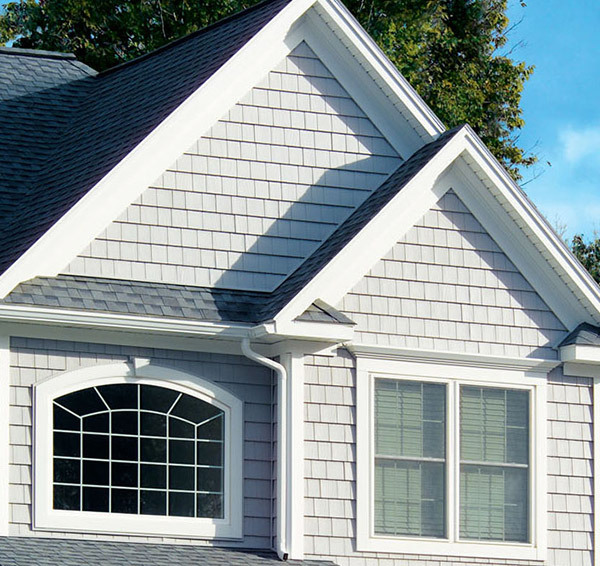 Feldco offers Madison homeowners with vinyl shake siding that’s designed to mimic the look of wood shingles while providing an energy efficient option. What is Vinyl Shake Siding? Traditional wood shingle siding creates a warm and inviting feel for your home. However, homeowners now realize that wood isn’t the best option for their Madison homes because it warps, rots and requires continuous maintenance to keep its looks. That’s where we come in. Our vinyl shake siding is made to replicate wood shingles with a wood grain texture and finish that looks like the real thing. People often use shake siding for areas like gables and and small sections to compliment the rest of their home. However, many people love the look so much that they side their entire home in shake siding. As opposed to wood, vinyl shake siding can handle any weather thrown its way. This is especially important for Madison homes because they go through some pretty hectic weather. Real wood shingles will eventually warp, swell or rot over time and cost you tons in repairs and maintenance. Vinyl shake siding is made to take a beating and look great through it all. You won’t have to worry about a snow or thunderstorm wrecking your siding when you choose vinyl shake siding from Feldco. You need your siding to keep the outside air from entering your home. When you choose Feldco, that’s exactly what you’ll get with our vinyl shake siding. The foam backing creates a secure and tight fit onto your home. Any outside drafts won’t be able to sneak into your home anymore and you’ll feel more comfortable as a result. Plus, with your home’s temperature being easier to regulate means you won’t spend as much on heating and cooling. Since vinyl shake siding is so durable and energy efficient, it comes with minimal maintenance. The same can’t be said with real wood shake siding. Wood requires constant care to prevent warping and rotting and you’ll also need to paint or stain it every few years. When you choose Feldco for your vinyl shake siding, the only thing you’ll need to do is give it a good cleaning every year or so. Homeowners in Madison trust Feldco for their shake siding because we provide a premium product at an affordable price, friendly and efficient customer service and quality installation that ensures every job is done right. Start your shake siding project with Feldco and join the over 350,000 homeowners who trust us.